Senior Johnathon Fisher picked up his fifth win of the season with his five-strikeout performance. A raucous crowd packed Victory Field in Clearwater Friday night to witness a showdown between district rivals that sit atop the 4A-4 standings. 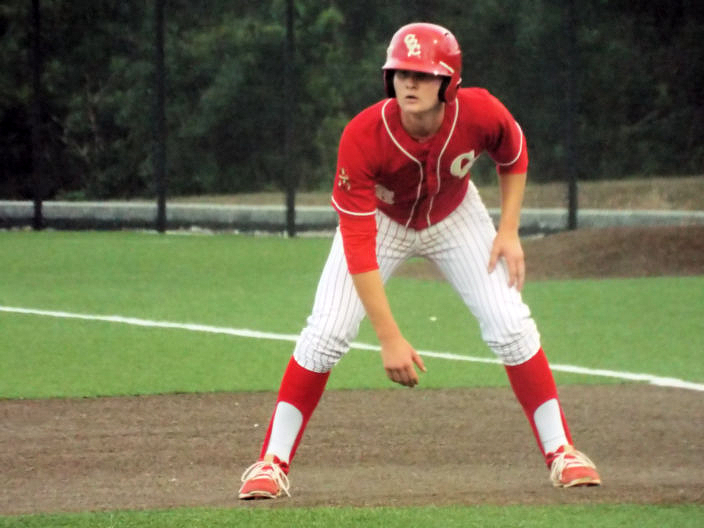 The Clearwater Central Catholic Marauders came in riding an eight-game winning streak and took the first lead of the game, however a Matheu Nelson two-run blast in the bottom of the first inning gave the undefeated Calvary Christian Warriors (#2 TB Power Rankings) the lead for good. 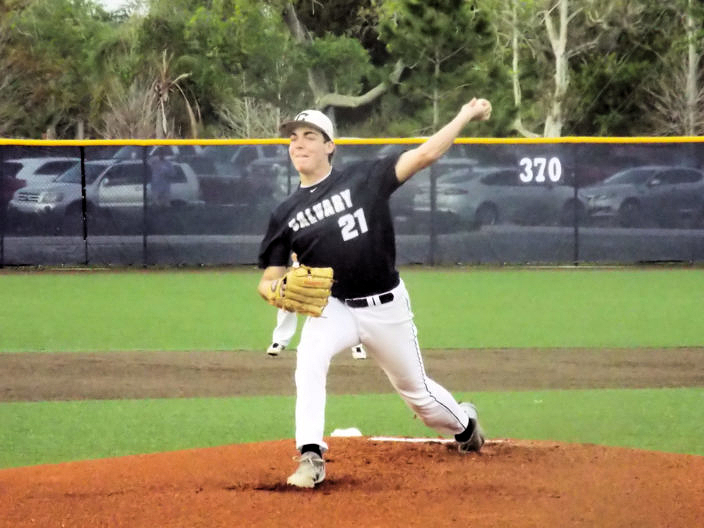 The Warriors tacked on three more runs and, behind the pitching trio of Johnathan Fisher, Braden Halladay and Graham Hoffman, shut down the Marauders’ offense and increased their district lead with a 6-3 home victory. Johnathan Fisher got the start for the Warriors (13-0, 7-0) and showed-off an arsenal of pitches in picking up his fifth win of the year. Fisher went four innings, allowing three runs, only one earned, on five hits, and striking out five batters. Michael Pittman takes a lead from first Friday night in the loss to Calvary Christian. Fisher had several pitches to choose from, all working to some degree, but he knew what worked best on this night. Braden Halladay and Graham Hoffman pitched the final three innings for the Warriors. Halladay threw 14 pitches in the fifth, striking out one. Hoffman allowed no base runners and struck out five in the final two frames to pick up the save. Michael Bessell’s RBI double in the top of the first inning gave the Marauders (9-4, 5-2) the first lead of the game, although it was short-lived. Four-unanswered runs from the Warriors made a 1-0 lead quickly turn to a 4-1 deficit. Bessell added a run in the third, part of a 2-for-3 night, and helped the Marauders climb to within one. Clearwater Central threatened again in the fifth with a man on base, but a nifty 5-4-3 double-play ended any threat to the Warriors. The Marauders were not able to muster much more on offense after that. Eric Kennedy reached base twice and score two runs in the Warriors 6-3 victory. Offense was not an issue for the Warriors on the night. Seven different players tallied hits and five different players scored runs, and they were led by catcher Matheu Nelson. After clobbering a ball 329 feet over the right-field wall in the first for a home run, Nelson added another another RBI on a single into center field to score Eric Kennedy to give the Warriors a bit of insurance. Nelson finished the night going 2-for-4 with three RBIs and two runs. The top of the Warriors’ order was all over the base paths from the very first pitch. Batters one-through-four combined to drive in five and score four runners on five hits. Kennedy led with two runs and Nelson with the three RBIs. Number two hitter Justin Bench reached based three times and drove in a run. Speedy shortstop Christian Cairo hit from the nine-hole and drove-in the difference-making run in the second inning. He added a stolen base late in the game, leading to a run scored. Every player contributed in the victory against their top rival. 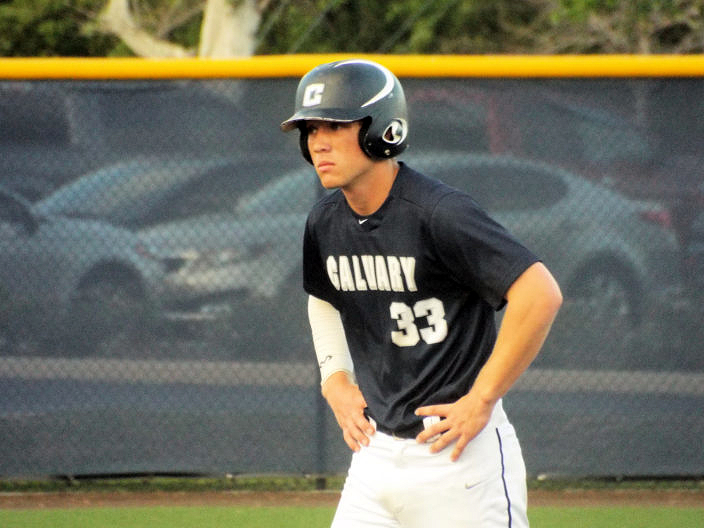 The win creates even further separation within the district, as Calvary has now have swept the season series against the Marauders and sits pretty atop 4A-4 heading into the final third of the season.